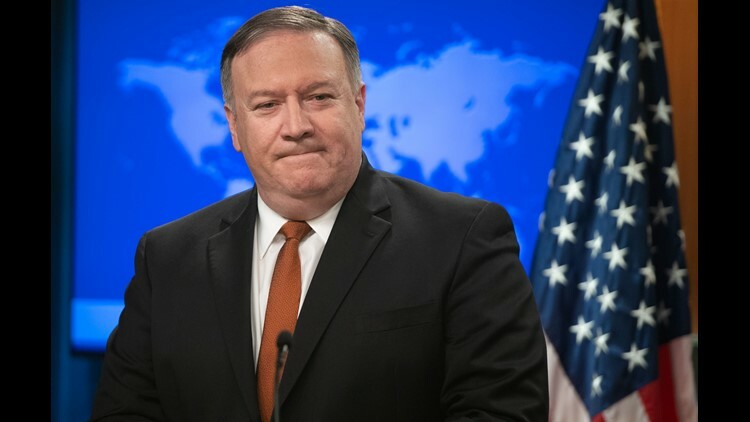 WASHINGTON – Secretary of State Mike Pompeo blasted his Obama-era predecessor on Friday for engaging in talks with Iranian government officials, saying John Kerry's actions were “actively undermining" the Trump administration's foreign policy. Kerry, who served as former President Barack Obama’s secretary of state, said in a national radio interview on Wednesday that he had met with Iran’s foreign minister, Mohammad Javad Zarif, “three or four times” since leaving his post. He said the conversations occurred at two conferences they both attended, one in Norway and another in Munich. Kerry said they discussed a wide range of issues, including Iran's role in the Syrian and Yememi civil wars – two conflicts where the U.S. is involved. But much of the focus has been on what Kerry said to Zarif about the Iran nuclear agreement. That deal, negotiated by the U.S. and five other world powers, was intended to block Iran from developing a nuclear weapon, in exchange for relief from crippling economic sanctions. Kerry was deeply involved in those negotiations during the Obama administration. Earlier this year, President Donald Trump withdrew the U.S. from that agreement, a move that Kerry has sharply criticized. Asked by conservative radio host Hugh Hewitt if he was "coaching" Zarif about how to handle Trump's withdraw from the deal, Kerry said no. "No, that’s not my job, and my coaching him would not, you know, that’s not how it works," Kerry said, according to a transcript of the interview. "What I have done is tried to elicit from (Zarif) what Iran might be willing to do in order to change the dynamic in the Middle East for the better. You know, how does one resolve Yemen? What do you do to try to get peace in Syria?" Kerry, in an interview this week with FOX News host Dana Perino, did not directly answer a question when asked whether he specifically told Iranian government officials to wait out President Trump until he leaves office. “I think everybody in the world is talking about waiting out President Trump,” Kerry responded. Pompeo said Kerry’s actions were aimed at “actively undermining U.S. policy” as directed now by Trump. “It is beyond inappropriate,” he added. Pompeo's comments came after Trump weighed in with a tweet that accused Kerry of holding "illegal meetings with the very hostile Iranian Regime." Trump posted that message just after 9 p.m. on Thursday. Trump suggested Kerry's talks would require him to register as a lobbyist for a foreign country. Kerry responded to Trump with a tweet of his own, suggesting the president did not understand the Iran nuclear deal and had bigger problems to worry about. Pompeo did not answer a question about whether he agreed with Trump that Kerry's meetings were potentially "illegal." In the Fox interview, Kerry dismissed any suggestion that he had acted inappropriately. Kerry said the meetings should not be confused with negotiations or interference with current policy directives. Asked by Hewitt if he had called Pompeo after his conversations with Zarif to give him a read-out, Kerry noted that his meetings with the Iranian official took place before Pompeo became secretary of state. Pompeo was sworn in on May 2, replacing Rex Tillerson as Trump's chief diplomat. Kerry accused the Trump administration of seeking "regime change" in Iran and said that would be a failed strategy. "It appears right now as if the administration is hell bent for leather determined to pursue a regime change strategy to bring the economy down and try to isolate further," Kerry told Hewitt in the radio interview. Pompeo rejected that assertion Friday. "That is not U.S. policy," he told reporters. "We are very supportive of the Iranian people having the leadership that they want." Pompeo also addressed North Korea, saying the Trump administration has no plans to weaken sanctions on Kim Jong Un’s regime. He said the sanctions are “central” to the president’s efforts to press Kim to give up North Korea’s nuclear arsenal. Pompeo accused Russia of trying to undermine international sanctions on North Korea.